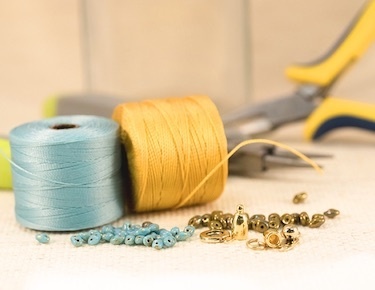 You've found a good value; you've bought a parcel of loose gemstones...now what? 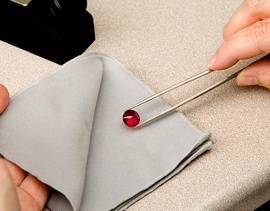 The number one request we get from gemstone customers is, "How can I tell what stones are in my parcel?" 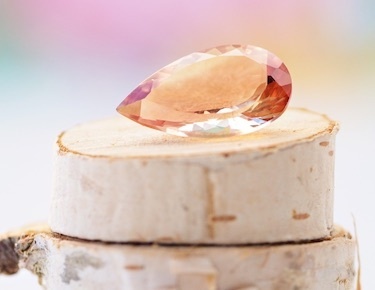 With practice, some gemological tools, and this guide, you can learn to tell the topaz from the tourmaline--and nearly any other gem--in about five steps. Plus, if you love a good mystery, you're in for a treat! Jay Boyle, senior gemstone buyer at JTV, is an advocate of practice. "Follow the procedure and try to train your eye as you go," he recommends. "You'll start to notice that red garnets are never really the color of Burma ruby or red andesine. Eventually, you get good enough to do a 'sight ID' and be right 98% of the time. It takes some practice and a good reference book or two, plus some basic gemological equipment." 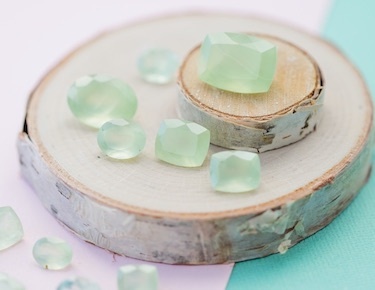 The easiest clue for separating and identifying gemstones is color. Color is a combination of hue, tone, and saturation, and you'll evaluate all of those during general observation. In general, don't shine a light through the stone to value its color, unless it looks black and you need light through the stone to determine if it's actually dark blue or green, etc. First, note your gemstone's basic overall body color (or "hue") by viewing it as a whole. Try to be as specific as possible--is it blue, or is it slightly greenish blue? Is it red, or is it slightly purplish red? There are 31 hues in GIA's color wheel, and the more specific you are, the better "evidence" you'll have when it's time to identify your stone. Is your gem's tone light, medium, dark, or somewhere in between? Tone describes how dark or light the color is, and GIA uses seven tone levels to describe colored stones, from very light through very dark. First decide if your stone is light, medium, or dark; then try to be more specific (very light, medium dark, etc.). Next judge the strength or intensity of the color (saturation) in one of six grades ranging from dull through strong to vivid. To assess saturation, first note whether your stone's color falls in the warm (yellows, oranges, reds) or cool (purples, blues, greens) color family. For warm-colored stones, look for brownness. The less brownness you see in the color, the better, and the higher the stone's saturation will be. More brownness indicates lower saturation for warm-hued stones. For cool hues, look for the presence or absence of grayness. Much grayness indicates dull saturation; little or no grayness is strong or vivid saturation. My instructor shared a good rule of thumb: If you don't "see or feel" brown or gray when you look at your stone, it probably falls in the "strong" saturation range. Vivid saturation is very rare. Now decide: Is your stone transparent, translucent, or opaque? Then determine how strong your stone's fire or dispersion is, if fire is present at all, and note whether it's strong, moderate, or weak. Bounce the stone in your palm to determine its heft. Does it feel as heavy as you think it should, considering its size? Does it feel heavier, or unusually light? This is a simple way to determine the stone's specific gravity. It's not exact, but it's close enough. 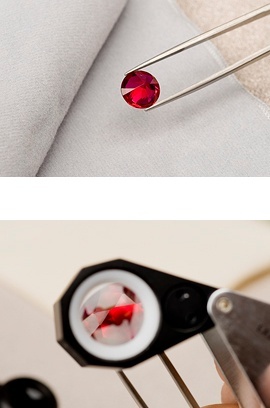 Pass a pen light or similar sharp, concentrated, incandescent light beam across the stone's surface to check for special optical characteristics (phenomena), like color change, asterism (star), chatoyancy (cat's-eye), adularescence (floating shimmer), aventurescence (sparkle), etc. Turn your stone so that light reflects off its surface (as shown) to assess its luster. View the stone with the naked eye as well as with a 10x loupe (as shown). What do you see? Is it dull, waxy, metallic, shiny like a diamond (adamantine), vitreous (glass-like), greasy, silky? If there are any chips on the stone, describe the surface inside the chipped area. Is it rounded like the rings on a seashell (conchoidal), straight like steps, granular, splintery, or just uneven? Also determine its luster in the chipped spaces. I've found that determining a gemstone's RI is the single most useful bit of information in determining what that stone is. Boyle agrees, stating that "the easiest and most accurate method of clearly identifying these different gems that can look quite similar in small sizes is to take the RI using a refractometer." However, using a refractometer takes some practice and can be frustrating until you get used to it; but once I got the hang of it, it was quite fun, and worth it. Before you begin, make sure that your stone is still clean. Also note that refractometers require a light source, so if yours doesn't have a light built in, you'll need to shine a light into the light port on the back of it. 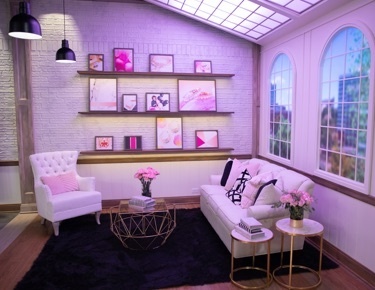 Almost any light will do, but monochromatic light will generally show you a crisper, clearer reading than white light. Close the refractometer's cover whenever possible while taking a gem's RI so that ambient light around you won't interfere with your reading. Finally, check your refractometer's calibration from time to time by taking a test reading on a stone that you know. 1. Touch a tiny dot (about the size of a pin's head) of RI fluid on the metal surface of the refractometer near the back of the crystal hemicylinder. The RI fluid is just meant to be a conduit between the stone and the crystal, so you don’t need much. 2. Using a faceted or cabochon stone, place the largest/best polished surface or facet face down on the fluid dot and slide it through the fluid toward the middle of the hemicylinder crystal (using your fingers as shown, not tweezers, or you'll risk scratching the very valuable hemicylinder crystal). Orient "long" stones (like marquise, oval, pear, or rectangles) lengthwise, aligned with the hemicylinder crystal. If you're testing a freeform stone, hold it so that some polished surface touches the fluid and the crystal, as shown, and make your reading. Remember that only polished stones will give an RI reading. Gem rough and unpolished stones will not give a RI reading. Note: If your stone seems too slippery, as if it's floating on the fluid, or if you see a rainbow of colors when you look through the viewer, use a tissue to wick away a bit of the RI fluid. Conversely, if the image you see through the viewer looks scattered or incomplete, or if the stone doesn't glide across the crystal easily, you might not have enough RI fluid. 3. Look through the viewer lens (without magnification, at first) for "the bubble" while you bob your head slowly. (Yes, bob your head.) If you don't see the bubble's outline, move the stone back and forth across the crystal slowly until you see it. Note the bottom of the greenish or grayish (depending on your light source) bubble outline (as shown). This is your approximate reading, to two decimal places or the nearest hundredth (0.01). 4. Now place the magnifying lens on the viewing lens and take a more specific reading, rounded to three decimal places or to the nearest thousands (0.01). Leave the stone on the crystal for birefringence testing. The key--at least for me--seems to be in the head bobbing. I know that sounds strange, and when the instructor said it in my gemstone ID lab class, I thought it was odd, but it proved to be true. I found that if I looked too hard or focused/concentrated too much, I couldn't see the reading, no matter how hard I tried. It's a few-times-removed reflection of a bubble of liquid, after all, so it's hard to imagine it being a very exact visual, but if you bob your head slowly while watching, it will appear and you'll hopefully get a close enough reading to work with. Some stones will show a very clear, very visible "bubble," but for the more shy stones, I recommend getting as close as you can and moving on. 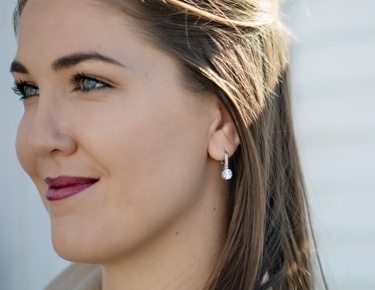 Most RI's are provided in a range of numbers anyway, according to Boyle, because "the refractive index of a gemstone can vary slightly depending on the location of the mine. Therefore, many books or RI charts will give a range." I found that in most cases, I had a better reading than I thought I'd gotten. You can always go back and try again later, if the number you get proves to be unhelpful. Birefringence testing will give you another important characteristic about your stone to help you determine its identity. To determine a stone's birefringence, while the stone is still on the hemicylinder crystal, you'll make a series of about six approximately 30-degree turns, until the stone has turned "upside down" or 180 degrees (as shown in the rotating image at right). Imagine the stone as an imaginary vertical line on a clock, reaching from 12 at the top (the edge farthest from you) down to 6 at the bottom. Turn the gem clockwise so that what was the top edge of the stone moves to about 1 o'clock, and take another RI reading. Continue turning the stone toward 2 o'clock, then 3 (which is half way, or a 90-degree angle), then 4, 5, and ending "upside down" at 6, taking an RI at each turn and noting them on a scratch paper. If it doesn't appear that the reading changes, do at least three turns to be sure. Subtract the lowest reading from the highest to find the stone's birefringence, rounded to three decimal places or to thousandths (0.001). Note: The RI fluid might dry up during the birefringence testing process. If the reading starts to look broken or scattered, wipe off the stone and the cylinder, add a new dot of RI fluid, and continue. Refractometer Tip: My instructor shared a great tip regarding the care of your refractometer. If you aren't going to be using it for awhile, rub a dab of petroleum jelly on the hemicylinder to prevent tarnishing. RI fluid itself has an RI of 1.80. This means that stones with an RI over 1.80 (like diamond, zircon, cerussite, sphalerite, and others) are "over the limit" (OTL) and won't show a reading. You also won't get an RI reading lower than about 1.35. Fluorite (1.434) and opal (as low as 1.37) are probably the lowest readings you'll see. 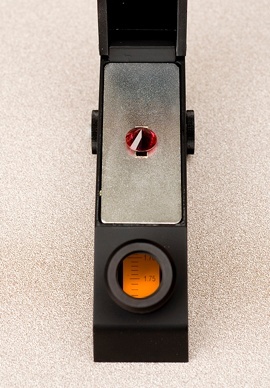 A polariscope is a simple tool that will help you determine if your gem is doubly refractive (DR), singly refractive (SR), or an aggregate (AGG). Note that only transparent and translucent gemstones should be used with a polariscope; opaque or nearly opaque stones won't provide a reading. 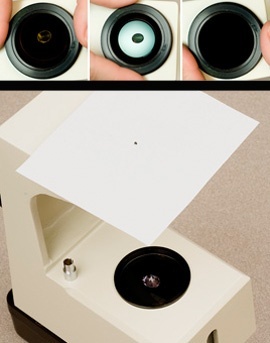 To use a polariscope, turn the light on and place your stone face down on the polarizer (the lower glass lens). Look down onto the stone through the analyzer (the top lens), turning the analyzer until the area around the stone looks the darkest. This is your starting point. Watching the stone, turn the analyzer a full 360 degrees, until the area around it becomes light and then returns to its darkest again, as shown. Tip: If you have trouble seeing the light/dark change in your stone, pierce a small hole in a white card and place it over the analyzer, as shown, to block out some of the distractions and light. Then peer at your stone through the hole and attempt to take another reading. A similar trick might also help you focus your eyes on the most transparent area of the stone if it is heavily included. If your stone appeared dark and seems to remain dark, it is probably SR, though it might be DR. In order to be sure, you should turn the stone a bit and take another reading, twice, checking the stone from at least three views. If it's still dark from all three views, it is SR. Once you've determined that for sure, stop with this test and move on. If your stone started out light and appears to stay light, it's probably AGG. Various factors can cause a DR stone to appear AGG, like inclusions or high RI readings.Your stone might "blink" from light to dark back to light, or vice versa. In that case, it could be either DR or SR with ADR, which means anomalous (false) DR. In this case, further testing is required. ADR stones include amber, opal, diamond, synthetic spinel, and garnets with red in their colors (orange, purple, red), as well as glass. While the stone appears "light," you might see a "crosshatch" appearance. 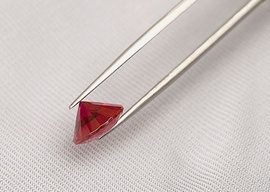 This is an indicator of an ADR and a good clue that the stone might be synthetic spinel. If you see dark and light bands that appear to move and even cross as you turn the analyzer lens, you probably have an SR stone with ADR. Stones with a high RI reading should be tested on their sides rather than face down to cut down on light bouncing around of off their facets and to provide the best results. Small stones might be hard to read properly. Try using the magnifying lens from your refractometer on top of the analyzer lens to get a better look. Also try to look at only the most transparent areas of your stone if it's heavily included. 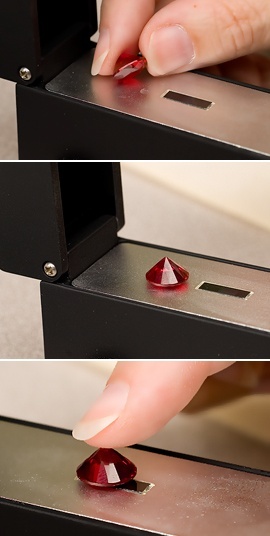 If your stone is red and you found a refractive index of 1.73 or greater, skip the polariscope and just use the dichroscope for this step. Congratulations! 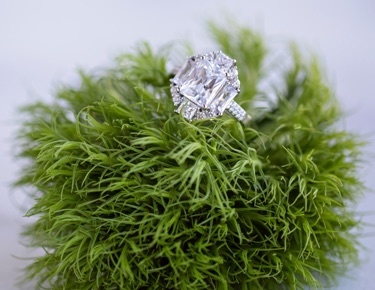 In most cases, you now have gathered enough information to determine your stone's identity. Find the gemstones that have your mystery stone's color and RI. 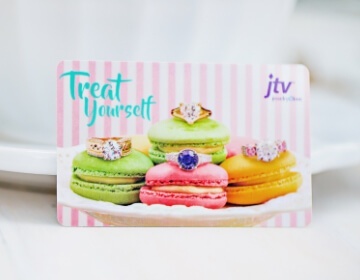 In many cases, that alone will positively identify your gem. According to Boyle, "You can clearly identify 95% of all gems with one simple test. Each gemstone has a unique RI that can be proof positive to identify the gems you have in your parcel." Match your information to the data on our Gemstones 101 pages or to the RI, birefringence, and other charts in Walter Schumann's book, Gemstones of the World. However, if that leaves you with more than one possibility, you can narrow your options with birefringence and double vs. single refractivity. Only a small percentage of gemstones will still be a mystery after these tests, and more advanced analysis and details will be required to positively identify them. You can learn the more advanced steps through GIA's Gemstone Identification course (available even through the mail or online) and week-long on-location lab class, like I did, or consult books like Antoinette Matlins' Gem Identification Made Easy and Richard T. Liddicoat's Handbook of Gem Identification. Boyle recommends both, sharing that "both books are excellent in walking the novice through the steps to identify a gemstone."